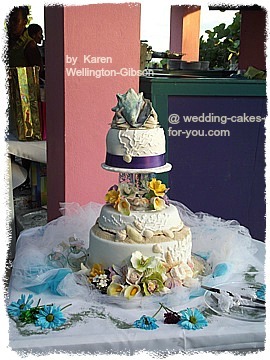 Sea Shell Wedding Cakes For You! 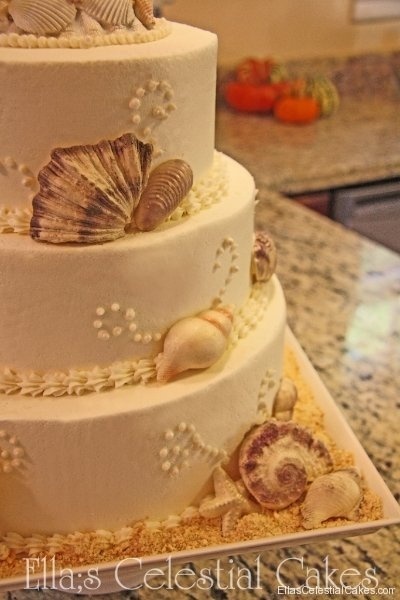 Sea shell wedding cakes for your beach side wedding. 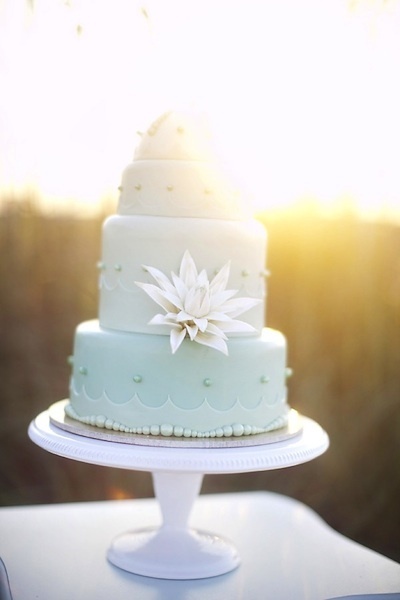 Browse the tropical wedding cakes and beach wedding cakes for ideas. 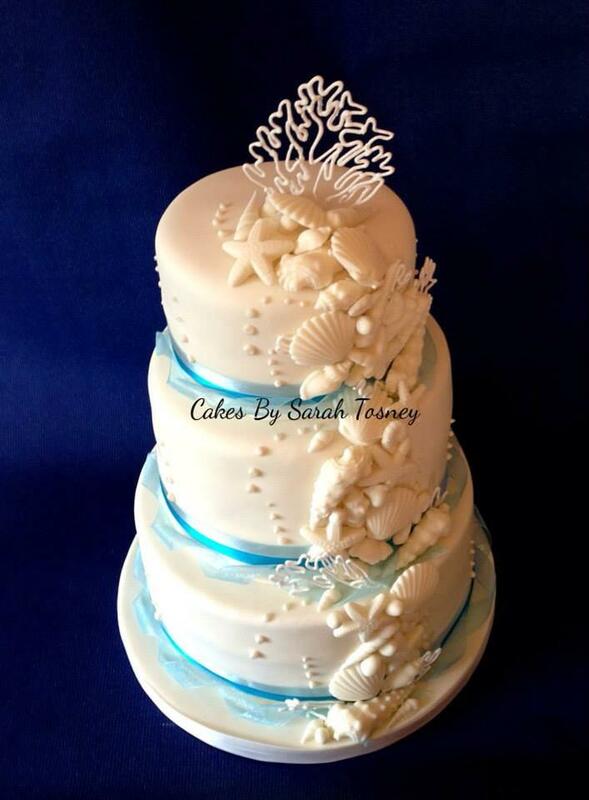 The most recent sea shell wedding cake. A three tiered chocolate buttermilk cake with chocolate mousse and raspberries...Yum!!! The cakes sizes are 12 inch, 9 inch and 6 inch. It's frosted in buttercream and decorated with gumpaste waves, royal icing corral and white chocolate sea shells detailed with glittery pearl dust. 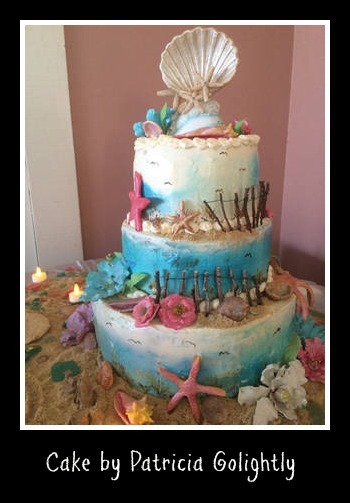 This seashell wedding shower cake was delivered to a yacht club. Enjoy the video which is a sped up version of the making and delivering of this gorgeous ocean themed cake. 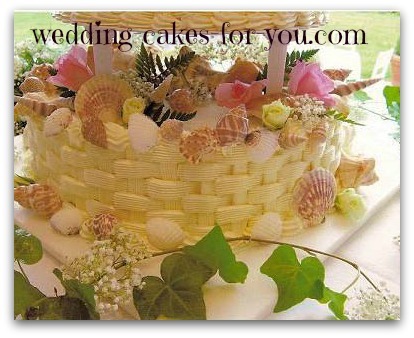 The beautiful texture of a buttercream/basketweave cake below, combined with a collection of real shells, is stunning. 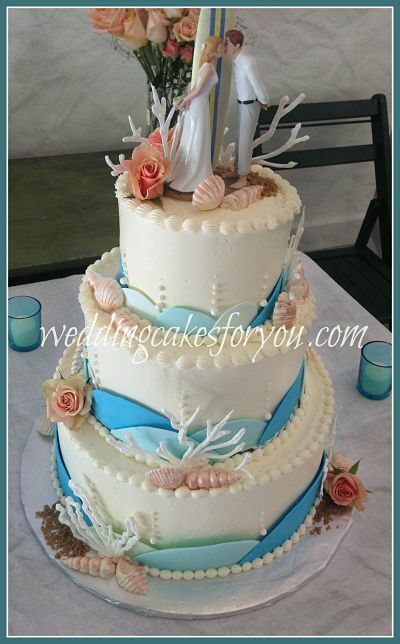 Pillars and plastic plates are used to give the cake height and for a place to put the seashells under each tier. The entire cake pictured here was three tiers, but I do not have a copy of the full view unfortunately. Flowers and seashells together are a nice touch and added to all of the contrasting textures and colors of this design. See more basketweave cake decorating ideas. 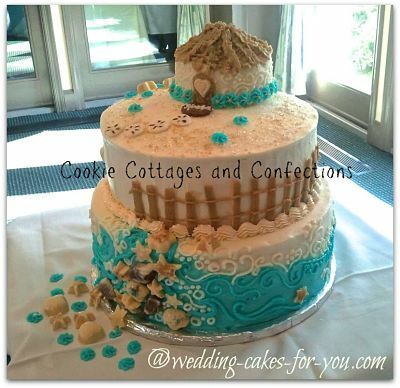 There was a lake view in the background which also lends a beach theme to the sea shell wedding cakes theme. Enjoy! 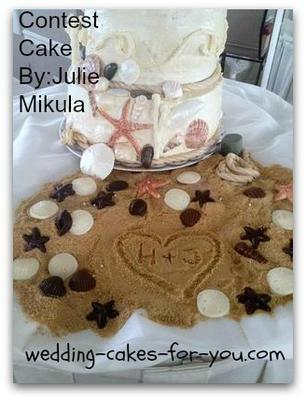 and I hope you find the cake inspiration for your wedding day.The top to the seashell buttercream cake is shown above. Shared at the Facebook page and now featured here is Melissa Brown's design that she made for her niece. The bride and groom were headed to Puerto Rico for their honeymoon. So pretty. The graduated colors from dark to light a.k.a ombre fondant is a nice touch too. A very natural looking cake with white chocolate sea shells and graham cracker sand? 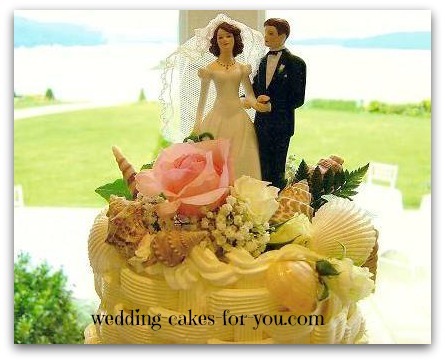 There are many opportunities to add your cakes if you would like to . Here are a few of the beach themed ones that people submitted with stories and recipes. This sea shell cake story comes with a recipe for a raspberry filling. Graham cracker crumbs make perfect sand. This very colorful gorgeous Caribbean design was all handmade from scratch. 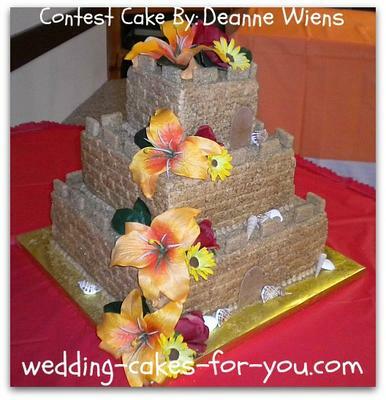 Read about Deanne's sandcastle design and how she went about making this whimsical wedding cake. These two images are from Istock. The beige ombre cake is very nicely done. Royal icing is used to make the coral and the little bubbles. White chocolate or gumpaste is most likely what the sea shells and the seahorses are constructed with. 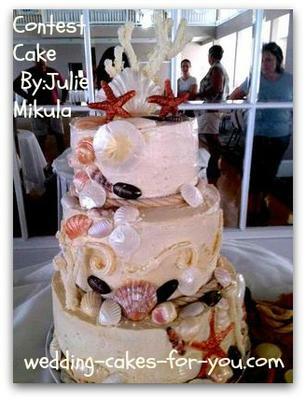 A garland of seashells adorn this three tiered wedding cake on the right. Looks like a fondant with buttercream borders and gumpaste decorations. If you would like to add your cakes go here.